Alfonso Cuarón’s long-awaited space-thriller Gravity has a straightforward plot driven almost entirely by the personalities of the two characters, Dr. Ryan Stone and Matt Kowalski, played by Sandra Bullock and George Clooney respectively. Kowalski is a cheesy, salt of the earth, veteran astronaut who spits out shaggy dog stories and dime store wisdom like chaw into a spittoon. Meanwhile Dr. Stone, in order to balance out Kowalski’s cartoonishness, is cold, brittle and, as we come to find out, obsessively blames herself for her daughter’s accidental death. She’s just as much a cliché as Kowalski, only she occupies a space opposite him on the stock-character spectrum. The two end up banding together, and bonding in intense ways after a rogue Russian satellite causes some kind of chain-reaction debris field resulting in irreparable damage to their ship. The debris field is of course orbiting the earth at a ridiculous speed, and so the two have a limited amount of time to seek refuge in the International Space Station. Things go from bad to worse — Murphy’s Law is taken to comical and exhausting extremes — but suffice to say that Kowalski dies and Dr. Stone eventually makes it back to earth, but not before coming to terms with the death of her daughter and talking herself into believing that she deserves to survive. The plot specifics matter less than the psychological arc of the film, which can be summed up by words from a much stronger movie about survival: Life finds a way. Gravity’s most obvious assets are its visual effects, which British-based Framestore spent three years perfecting. The film, especially when seen on IMAX, looks fantastic. 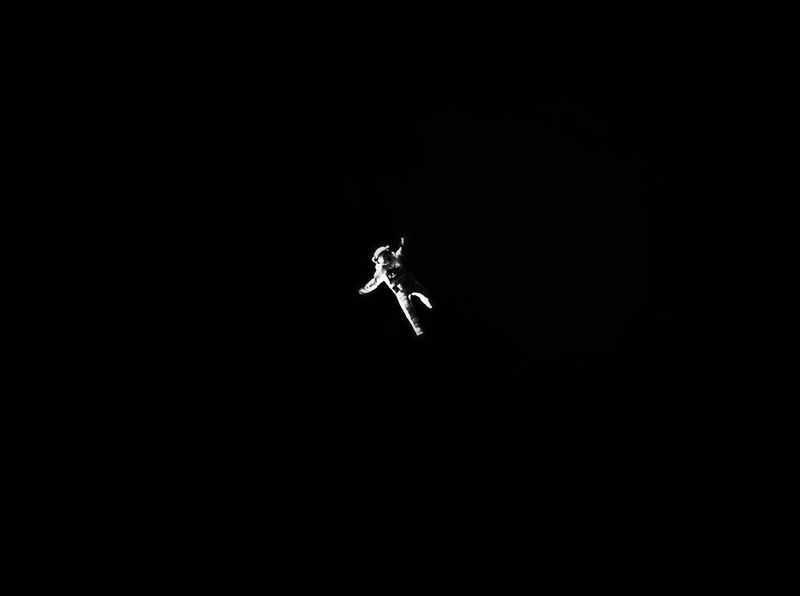 Space seems vast — so vast that it’s almost claustrophobic, pressing in on the tiny humans unmoored from their home planet and enveloping them in black vacuum. I know there have been a million objections to certain discrepancies with the physics of the film, but I don’t really care. And I’m not really sure why others do either. It’s a work of fiction, after all, and doesn’t owe anything to the known physical laws of the universe. How boring would science fiction be if that were actually a criterion by which we judged it? The special effects in Gravity are cool, not because they flawlessly reflect what scientists believe would happen if the event were to actually occur in space, but because they support the emotional and psychological themes of the movie in an entertaining way. Similarly, a lot of effort was put into making sure the sounds were right from a scientific standpoint. Since there isn’t any air in space to transmit vibrations, the only way you can sense the sound of something is by touching it and feeling the vibrations yourself. Of course it’s an interesting science factoid, and it’s great that the film remains loyal to it, but the formal technique wouldn’t matter at all if it didn’t serve to reinforce the theme of isolation in a barren, hostile environment. This is a science fiction survival fantasy, not a space documentary. As a species of storytelling, science fiction is a modern variant of the literature of allegorical quest. It often takes the form of a perilous or mysterious journey, recounted by a venturesome but ignorant traveler who braves the obstacles to confront another reality that is charged with revelations. He — for it is always a he — stands for humanity as apprenticeship, since women are not thought to be representative of human beings in general but only of women. A woman can represent Women. Only a man can stand for Man or Mankind — everybody. Of course, a female protagonist can represent The Child — as in Alice in Wonderland — but not The Adult. Gravity gives us the perilous journey, mysterious in its alien ferocity, braved by an ignorant traveler who confronts the most human aspects of self in the most inhuman of environments, and so fits squarely in the tradition of the science fiction allegory. But Mankind being represented by a woman subverts the allegorical tradition, and the film is not overly self-congratulatory about it. It’s taken as a matter of course that Dr. Stone’s position, fears, and ultimately strengths are shared by each viewer. But despite its many commendable characteristics, the film is ultimately disappointing. In the decision that Dr. Stone is forced to make, whether to struggle for survival or not, there’s a sort of middlebrow echo of Camus. The message is a little pat. The psychology is a little obvious. The initial use of space as death, as a sort of anti-life, is interesting, but in turning the movie into a banal statement about the will to survive, there’s an avoidance of any interesting exploration of darker motifs. Gravity fails in a very American way: the lone individual triumphs over nature, energized by her sense of self-value. It’s an ethos not too different from something you might find in a self-help manual. The key to ultimate happiness? Believe in yourself. You can do it! And so instead of darkly resonating, the film peters out into a Hallmark message. Perhaps the most interesting scene in the film is when, for a brief moment, Dr. Stone is able to achieve radio communication with someone speaking a language that she can’t understand. In the background you can hear dogs barking and a baby crying. It isn’t obvious yet that Dr. Stone will survive (oh, but you know she will), and so the moment is poignant — two disembodied voices arcing the shallow atmosphere and connecting partially, as all connections are partial. This might be the last person that Dr. Stone will ever speak to. And when the scene drifts into another frenzied action sequence, you miss its depth. It so happens that Jonas Cuarón, the director’s son, actually made a short film based on that scene, shot from the perspective of the man on earth. The seven-minute short, called Aningaaq, reveals the voice to belong to an Inuit fisherman in Greenland. Mostly, the fisherman talks about his dog dying, but that’s sort of exactly how you wish Gravity itself had been shot. The inevitability of death and disconnection being momentarily bridged by imperfect communication with another human. You want the movie to embrace the sweet weaknesses that impossibly bind us, not sink into steroidal self-affirmation. Maybe even more intriguing might have been two hours of Dr. Stone tethered to the corpse of Kowalski, drifting into the directionless cold of space, having one-sided conversations with him and possibly, occasionally, answering for him. Somehow though, I doubt that movie would have made $700 million in the box office. Lest we forget, Americans have a history of bringing our own banalities into space with us. One of the first things we did when we got to the moon was play golf.